Tiny doll houses, Christmas towns, and model railway villages are adorable—but they can also be very expensive. Fortunately, there's a very inexpensive option: printable buildings you can produce with a computer, a printer, and tape. Select, print, and build these to create anything from complete towns to table decorations. Many sites offer these printables free of charge; others charge a nominal fee. Many of the wonderful buildings available online are designed to scale; some are fanciful while others represent real places. Discover links to sources of free printable buildings in many scales, from 1:24 or G scale for dolls houses and railway buildings, to smaller scales for railroads, dioramas, and gaming terrains. Most of the options are in full color, but some are specifically designed to be colored by the user. This series of 1:144 printable houses has everything from a cemetery to a vampire castle. You can combine these buildings with the traditional glitter village buildings to make an even larger Halloween village. Add sound effects and dark lights, and share the creepy experience with friends. 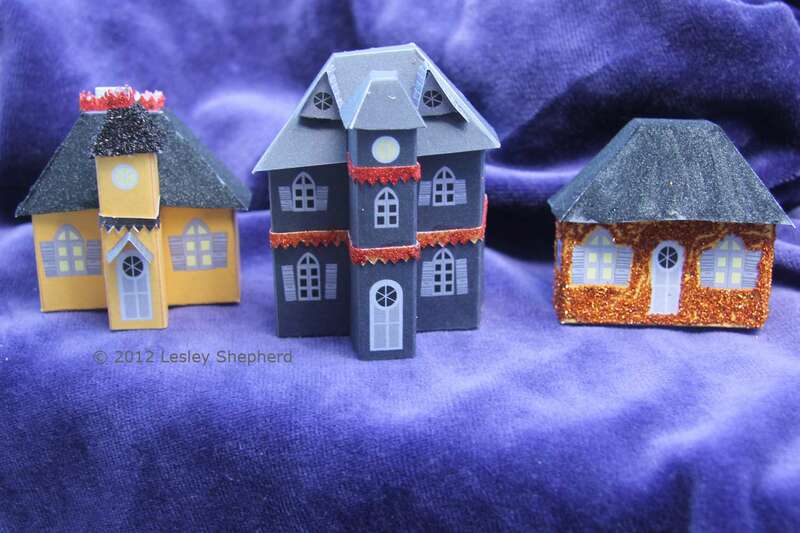 There are also a set of Miniature Halloween buildings in this glitter house style. All of these little buildings can be made with or without glitter. The Online Theatre Collections of the famous Victoria and Albert Museum in London has two antique paper toys available from downloadable files. One is a revolving circus, which could be scaled to at least 1:48 scale, with O scale train figures substituted for the circus animals and made into a carousel. The second featured toy is an antique toy theater, originally published by Pollocks Toys, complete with figures for a Cinderella pantomime. The Theatre is designed to be colored, so there is lots of scope for turning it into a dolls house scale toy, or the front stage of a model building. All Gauge Trains have two separate sections of their website devoted to printable scale buildings. For N to G scales, they have a New England Seaside town, Yule City buildings suitable for a Christmas railroad, a Western Town, Farm and Country buildings, and industrial buildings. They also have a range of O, O27 and S scale buildings in basic styles. ScaleScenes specializes in printable railroad buildings, but also offer an intriguing line of ship models, standalone sets of windows and other exterior elements, and entire street fronts from country and city locations. Fiddler's Green, famous for their airplane models, also produces scale models for an English village and a Frontier Town. The models are sold for a reasonable price and can be downloaded and used multiple times. They are available singly or in collections. Zippy's Models have free printable models of a British watermill, a Stone Age Hut, and an English Timber Framed cottage in OO or HO Scale. Ray Keim's Paper Model Purgatory pages contain free detailed printable models of Disney's Haunted Mansion Rides, including Liberty Square and New Orlean's Square approximately 1:66 scale. There are also details for entrance gates, tombstones, coffins, and the tower from Pirates of the Caribbean. The buildings can be resized to be made in several different scales. Paper Toys produce free printable miniatures of several famous buildings, including the Chrysler Building, Eiffel Tower, Dubai clock tower, Empire State Building, Statue of Liberty, Neuschwanstein castle, and Frank Lloyd Wright 's Falling Water. These are not listed at any particular scale. Shadowulf's western town is designed for 25-28 mm scale wargaming. This isn't the same as the old Shadowolf set from Australia but has a lot of similarities. You can either print the buildings yourself from the 'download original' link visible when you click on a building, or you can order them as printed buildings or sets. Canon Creative Park is the motherload of free printable miniatures. Their Buildings of the World section has everything from famous Japanese Temples to the Roman Colosseum and Mont Saint Michel. The seasonal section contains a complete Santa Claus House. This page contains free downloadable kits for paper models of a plains tipi, an Iroquois longhouse, a set of various styles of houses from prehistoric Ohio, and a Northwest Coast Cedar House. Crechemania has a number of free downloads for paper creches and Nativity scenes To find them on their site, do a search for free downloads, or search their downloadable creches for the free versions. The free Svetava Creche #5 includes a full Nativity to print and assemble from three letter-sized sheets of paper.